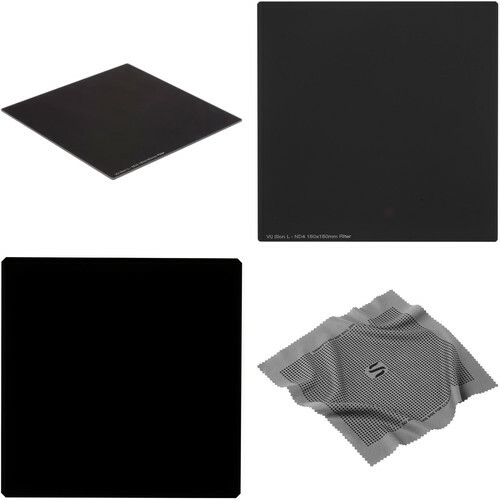 This Vu Filters 150 x 150mm Sion L Neutral Density Filter Kit from B&H contains three optical glass filters that can be used individually or in various combinations to create a darkening of the entire image, allowing you to photograph with a wider aperture or slower shutter speed than normally required. By slowing your exposure time or increasing your aperture, you can control depth of field and convey movement more easily. Neutral density filters do not affect the coloration of the image and are ideal for pairing with other filters. The included filters consist of solid neutral density filters that reduce the amount of light entering a lens by three, four, and ten stops, respectively. To allow these filters to be placed in front of a lens, a separately available Vu Filters VFH150 150mm Professional Filter Holder or a filter holder system that can accommodate 150mm wide, 2.3mm thick filters is required. Box Dimensions (LxWxH) 8.0 x 7.0 x 1.0"
Box Dimensions (LxWxH) 7.6 x 6.9 x 0.7"
Box Dimensions (LxWxH) 7.559 x 6.929 x 0.787"